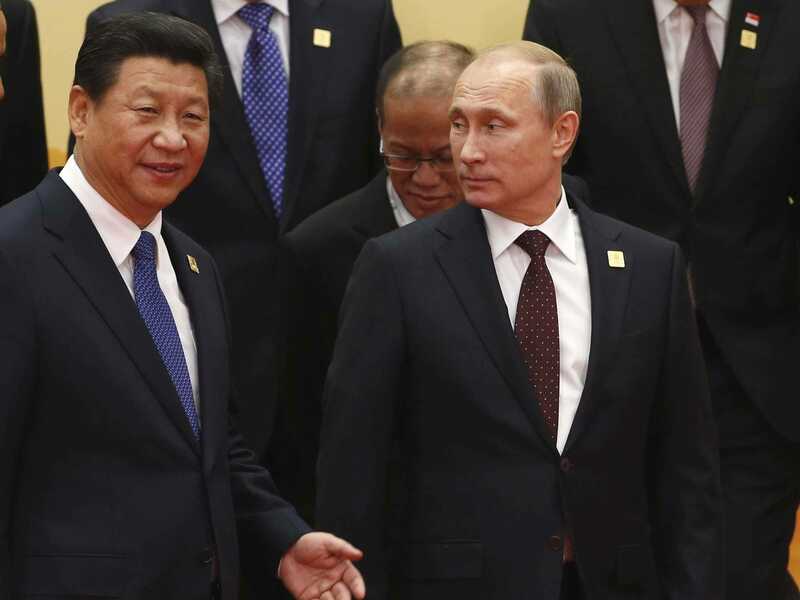 REUTERS/Kim Kyung-HoonChina’s President Xi Jinping and Russia’s President Vladimir Putin. Last month Russian Finance Minister Anton Siluanov announced that Rosneft, Russia’s largest oil company, had requested 2 trillion roubles (then $US49 billion) from the state’s National Wealth Fund (NWF) to help it meet its funding requirements. The request was refused but it left questions over how the oil company planned to meet its $US30 billion in debt repayments due over the next year after the oil price collapse of recent months. We now have the answer — a large part of it will be paid by China. As part of the deal struck between China and Russia at the Asia-Pacific Economic Cooperation (APEC) Forum in Beijing, Rosneft has agreed to sell a 10% stake in a Siberian unit to state-owned China National Petroleum Corp. The news was seen as evidence of Moscow seeking to deepen ties with Beijing as Western sanctions over Ukraine have left it isolated from European and American markets. It is the second such deal to have been struck this year after a $US400 billion agreement was reached in May between state-owned gas companies Gazprom and CNPC (China National Petroleum Corporation). Not only have the deals helped in part to sooth fears over Russia’s stagnating economy but they now also appear to have backstopped Russian companies that have been frozen out of international capital markets. A combination of the oil price falling from $US115 a barrel in June to below $US82 on Wednesday and the collapsing rouble had compounded pressure over recent months. Rosneft’s $US30 billion bill went from being worth around 1 trillion roubles in June to around 1.4 trillion as at Wednesday’s exchange rate, while lower oil prices squeezed its revenues. Rosneft “can get significant advances from Chinese state-owned CNPC on account of oil supplies” in 2015, and that should be sufficient to cover the remainder of its debt payments. The deals have helped bind the corporate liabilities of the two countries together. In essence China is promising to provide the dollar credit line that Russian companies sorely need, and which the Russian state is increasingly withholding, in exchange for increased control over the commodity supplies that its growing economy will require. However, unlike China’s state-backed firms, Russia’s quasi-state-owned national champion companies are not in as good health as they ought to be. Rosneft’s third quarter profits were all but wiped out as falling oil prices and the cost of sanctions bit into its bottom line. In September the company pledged to cut up to 25% of the 4,000 staff based at its Moscow headquarters to reduce costs. Igor Sechin, Rosneft president and close ally of Russian president Vladimir Putin, tried to dismiss fears over the firm on Wednesday saying the refusal of its request for state support was “neither critical nor dramatic” but was careful to leave the door open in case the state alters its position. However, former finance minister Alexei Kudrin issued a warning to the company over applying for state funds. The Russian state has already burned through a large amount of its foreign currency reserves defending the rouble, so it may be unwilling to step in to cover corporate debt repayments, which are set to reach $US140 billion in 2015. With their access to Western capital markets blocked by sanctions it appears that Russian corporates will increasingly have to look towards trading partners in the east for support. The question now is whether Beijing will continue to view the deals it has struck as being to its own advantage — especially if commodity prices are set to remain at or below current levels.